This disease was recently observed in a tomato greenhouse. This article will review tomato spotted wilt virus symptoms, biology and management. 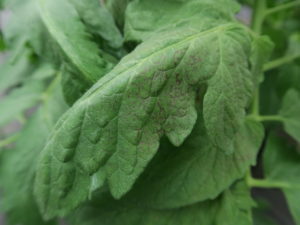 Tomato spotted wilt virus (TSWV) and the closely related Impatiens necrotic spot virus (INSV) are usually observed in greenhouse or high tunnel situations. Both TSWV and INSV affect many hosts, including vegetables and flowering ornamentals. Symptoms vary according to host, stage of plant affected and environmental conditions. Both diseases can cause stunting, yellowing, necrotic rings, leaf mottle and more. Figure 1 shows a tomato leaf with a necrotic mottle caused by TSWV. Figure 2 shows tomato plants stunted as a result of infection by TSWV. Additional symptoms may be viewed here . Since the symptoms of these two viruses vary, plants with suspicious symptoms should be submitted to the Purdue Plant and Pest Diagnostic Laboratory for confirmation of virus symptoms. TSWV and INSV cannot spread without thrips. Thrips are small insects less than 1/20th of an inch long (Figure 3). To detect thrips, tap a flower over a white sheet of paper. Look for the small insects to move quickly around the sheet of paper. Alternatively, shake flowers vigorously over a glass of water. The insects will fall into the water 10X hand lens may help to detect thrips. Yellow sticky cards placed at crop height will help to detect these small insects. Thrips feed by scraping the leaf or flower petal surfaces with their mouthparts. Thrips may acquire and transmit either of these viruses by feeding. Thrips feeding damage often results in a light brown or gray necrotic area. The necrotic area may be dotted with very small dark spots which is frass of the insect (Figure 3). Figure 1: The necrotic mottling on this tomato leaf is caused by tomato spotted wilt virus. 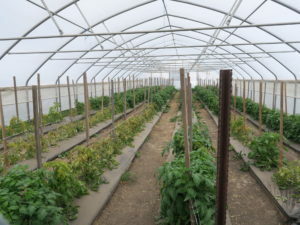 Figure 2: Some of the tomato plants in this photo have been stunted as a result of infection by tomato spotted wilt virus. 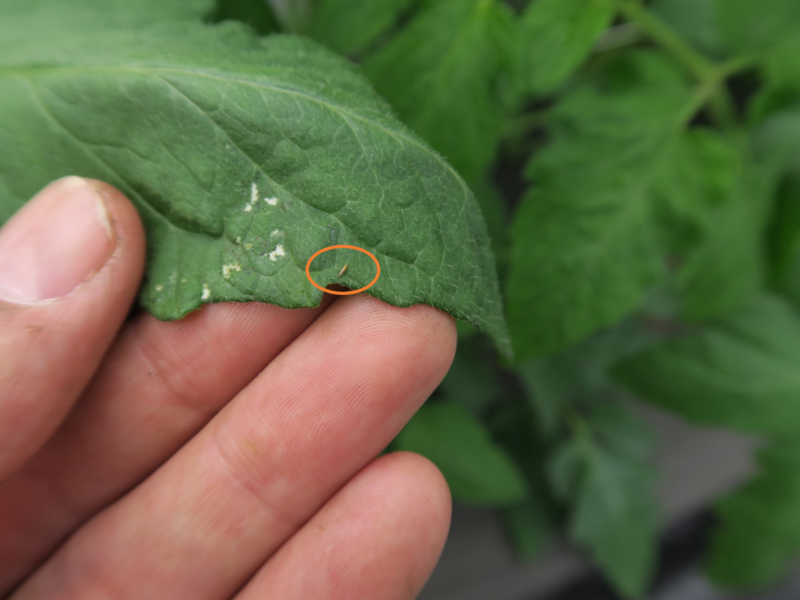 Figure 3: Thrips feeding damage and dark spots due to frass can be observed on this tomato leaf. An adult thrips can be observed to the right of the feeding damage. Preventing TSWV is easier than halting the spread of this important disease. Avoid growing vegetables and ornamentals in the same greenhouse. Even vegetable transplants and ornamentals grown together may risk the occurrence of these virus diseases. TSWV may be introduced on ornamentals that are propagated by cuttings or plugs. The disease can then spread to vegetables. Although thrips do not usually overwinter in the Midwest, in a covered greenhouse structure, thrips may survive, especially if there is plant residue. They can overwinter as adults on plant residues and potentially as immature stages in the soil. The following steps may be used to help reduce the severity of TSWV or INSV. Use transplants known to be free of both INSV, TSWV and thrips. Plant resistant varieties if possible. For example, there are a few tomato cultivars with resistance to these virus diseases. Use yellow or blue sticky traps to monitor thrips populations or by direct observations of the flowers. Thrips should be managed with insecticides when populations reach an average of 5 thrips per flower. However, if plants show symptoms of INSV or TSWV and thrips are present, control measures should be implemented regardless of number of thrips per flower. 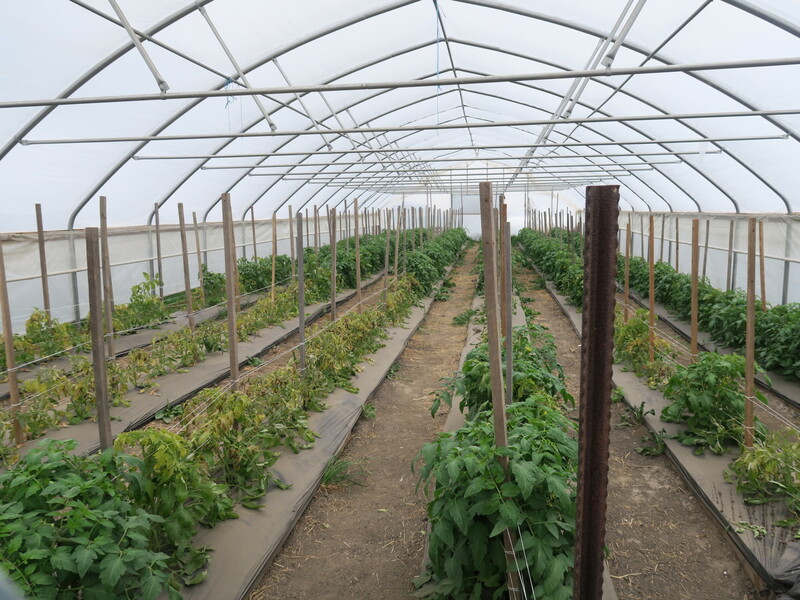 Effective insecticides that can be used in the greenhouse include Entrust®. When using insecticides to control thrips, coverage is critical. Thrips are very small and often hide in seams and crevices, so make sure you have sufficient water and pressure to get the insecticide where it is needed. If INSV or TSWV symptoms are suspected, send samples to the Purdue University Plant Pest and Diagnostic Laboratory. See below for information about biological controls for thrips. Remove symptomatic plants from a greenhouse with INSV or TSWV. Do not compost such plants; instead destroy them. Avoid crop debris in the greenhouse such as older leaves that have fallen or pruned leaves. There are a variety of natural enemies that can be used to control thrips, as an alternative to pesticides. It is important to remember that a portion of the thrips lifecycle occurs in the soil. Control methods should target both the leaf-feeding stage and the soil pupation stage of this pest for full control. Above ground, Orius insidosus and the predatory mites Neoseiulus cucumeris and Amblyseius swirskii are commercially available. If your plants are irrigated using misters or overhead sprinklers, do not use predatory mites because they will be washed off. For control of the pre-pupal and pupal stages which occur in the soil the predatory rove beetle Dalotia coriaria and the predatory nematode Steinernema feltiae offer good control. All of these agents are available from a variety of commercial suppliers. If there is a high risk of virus incidence, biological control agents may not be compatible because of increased movement to avoid predation, which has been shown in other systems. Both INSV and TSWV can be difficult to manage once established in a greenhouse or high tunnel. Pay close attention to the prevention measures discussed above.